Welcome back! Today, I’m thrilled to spotlight the awesome Christa Carmen. 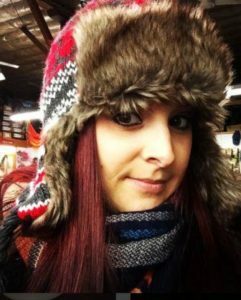 Christa is the author of numerous short stories that have been released in venues such as Unnerving, Tales to Terrify, Mad Scientist Journal, and DarkFuse Magazine. 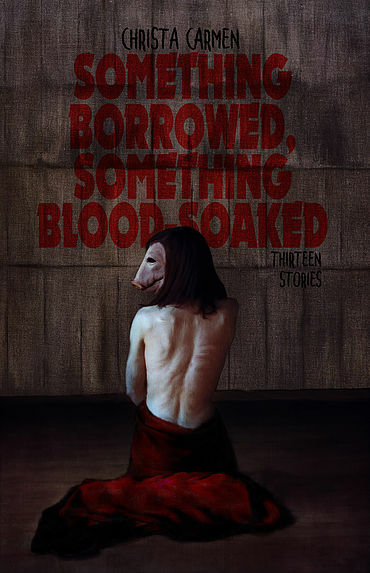 Her debut fiction collection, Something Borrowed, Something Blood-Soaked, is forthcoming from Unnerving. Earlier this month, I was fortunate enough to meet Christa at StokerCon in Providence, and she is truly as delightful and fabulous in person as I’d hoped! Earlier this year, she and I discussed her inspiration as a writer, the way her stories develop, and what she has planned for the future. I’ve been submitting my work for the consideration of publication only within the last two and a half years, but I’ve always considered myself a writer. The idea of writing professionally, writing consistently, writing for something other than my own enjoyment or for catharsis, writing with intent for the work to see the light of day rather than fade and wither in the bowels of a desk drawer somewhere, this was a foreign concept to me for quite a long time. It’s strange, because I’ve always been enamored of everything to do with books; with the stories themselves, and the authors who wrote them, with movies that were adapted from books and literary series that told sweeping or genre-bending tales, with the illustrations that graced the covers of my favorite novels and the libraries and bookstores that housed them. But the idea of becoming a writer myself was stymied by a longstanding preoccupation with alcohol and drugs. I’m sober now, and have been for a while, but throughout much of the time I could have spent determining if the passion I’d always had for writing could have translated into a viable career option, I was struggling to keep my head above water while the metaphorical eight-hundred pound gorilla clung to my back. I don’t regret that this was the case; while my commitment to writing may have been delayed, the experiences I endured, and how those experiences shaped me as a person, inform my writing today. As far as some of my favorite authors go, the list is pretty expansive, but I’ll try to keep it brief: Carmen Maria Machado, Kelly Link, Stephen King, Sarah Waters, Jack Ketchum, Ania Ahlborn, Shirley Jackson, Joe Hill, Caroline Kepnes, Ruth Ware, R.L. Stine, Dean Koontz, Jessica McHugh, Michael McDowell, Stephanie M. Wytovich, Roxane Gay, Peter Straub, Agatha Christie, Dan Simmons, Damien Angelica Walters, Mark Z. Danielewski, Harper Lee, H.P. Lovecraft, Annie Hartnett, Cormac McCarthy, Edgar Allan Poe, Sarah Pinborough, J.K. Rowling, & B.A. Paris. As a horror author, are there certain themes that you find yourself returning to again and again, those concepts that really get under your skin? On the other hand, are there topics or themes you’re eager to try as a horror writer, or even ones you’re not quite ready to explore yet? When it comes to writing horror, the themes that I find myself returning to are more psychological in nature. We know that what one individual finds horrifying may not even register as a blip on the fright radar to another. While a great horror story might err on the more conventional side of what human beings find scary, I think that the truly frightening stories are those that deal with the darker parts of the human psyche, those parts that many of us repress or deny. Home invasion thrillers can inspire security system checks to rival those of an obsessive-compulsive; zombies and vampires make us read of the latest swine flu outbreak or blood-borne virus discovery with an increasingly mistrustful eye. But psychological horror done right exposes our universal vulnerabilities, makes us experience those unpleasant, unsettled, uneasy feelings we work so hard to avoid. As for topics or themes I’m eager to try as a horror writer, or ones I’m not quite ready to explore yet, I think it’s pretty safe to say that anything that pops into my head as a subject or theme I could potentially write about, I’m willing to pursue. That’s not to say that uncharted thematic territory won’t require more of a time commitment than a subject or theme I’m familiar with. For example, I have an unfinished horror novel called 13 Sessions, about a thirty-something year old woman who pursues acupuncture as a personal infertility treatment with monstrous results, and an unfinished short story, “I Have No Mouth For I Mustn’t Scream,” about a woman whose pregnancy complications have rendered her mute for the entire forty weeks of gestation, so that should tell you a little something about how confident I am with themes related to that subject. 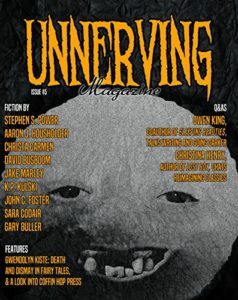 You have a story appearing in Unnerving Magazine #5. Could you tell us about the inspiration behind that piece? 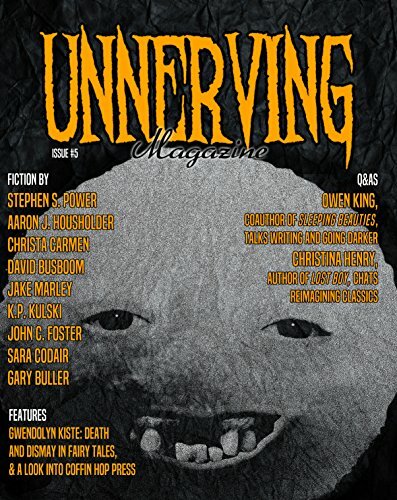 The inspiration behind the story appearing in Unnerving Magazine #5, “Red Room,” is probably a great deal more interesting than that of my other stories. The story is about a woman who, despite her fiancé’s belief to the contrary, is convinced she should be concerned by the gruesome photos appearing on her phone, and whose fear proves justified in a rather ghastly, albeit unexpected way. Not long after reading this article, something odd happened. I woke up the morning after a wedding to a series of photos on my phone that I did not take. The photos were of two men in a bar, and they had an eerie, old-fashioned feel that lent them a patina of wrongness as palpable as any Instagram filter. The next day, at a post-wedding brunch, the topic of the inexplicable photos came up. The reaction from several men in the group was that, one way or another, I had to have been the cause of these photos appearing on my phone. “You probably just screenshotted them from a website,” or “you must have accidentally downloaded them.” As I mentioned previously, I’m not a drinker, so the activities of the night before were clear in my mind. This complete unwillingness to believe that the photos had appeared through no action of mine collided in my head with the echoes of Asher-Perrin’s article, and “Red Room” was the result. You currently live in Rhode Island, a state with its own haunted and cosmic horror history. Do you find that your home state often inspires your work, or do you tend to look for creepy inspiration elsewhere? Rhode Island does often inspire my work! I’d say 95% of what I write takes place somewhere in my home state; the novel that I’m currently working on is set not only in my home state, but in my hometown of Westerly, with much of the action occurring along the coast, in Misquamicut and Watch Hill, and many of my short stories take place in Mysticism, a fictional town that exists somewhere between Westerly and Charlestown, and borrows a portion of its name from Mystic, Connecticut. I think the consistent use of RI as setting can be attributed to a combination of two factors. First, there is absolutely something haunted and horrific about the smallest state in the US. Especially in the beach communities at the southern part of the state, there’s such a sense of isolation in the winter, of things lurking in the cold and waiting to awaken. Additionally, while I don’t necessarily subscribe to the oft-repeated ‘write what you know’ adage, I find that in terms of place, setting a work of fiction in a locale with which you are intimately familiar makes for fiction that’s more dynamic to read, and more enjoyable to write. As a short fiction writer, do you have a specific approach when you’re crafting a new story? Do you tend to start with an image or a character or a theme, and write toward exploring that idea? Or does it entirely vary from project to project? The reason I wrote that the inspiration behind “Red Room” is worthier of reveal than that of my other stories is because my approach to writing short fiction is usually fairly straightforward. I have a designated ‘Ideas’ notebook with a section for singular, striking images, and when I see something I find haunting or unusual, I write it down. Sometimes an image connects rather quickly with an idea, for example, I took a long course on legends through the Carterhaugh School of Folklore and the Fantastic, and became captivated with the internet legend of the ‘Stairs in the Woods’ (google ‘Stairs in the Woods Reddit’ if you want to fall down that particularly eerie rabbit hole). I’d already been tossing around the idea of writing a story inspired by some of the women on the methadone clinic at which I was a clinician from 2010 to 2013, and when I thought more about the image of a staircase in the forest, and the type of person who might find the idea of walking up that mysterious staircase to an unknown destination appealing, the story unfurled from there. It’s probably not much different from what Stephen King says about where his ideas come from in On Writing: “…good story ideas seem to come quite literally from nowhere, sailing at you right out of the empty sky: two previously unrelated ideas come together and make something new under the sun. Your job isn’t to find these ideas but to recognize them when they show up.” I’d say that’s a pretty solid explanation for my process. You were married on Halloween 2016 at the Stanley Hotel (congratulations, by the way!). That hotel, of course, served as the inspiration for The Shining. When did you first visit the hotel, and did anything spooky or strange ever happen to you there? Also, have you visited other horror landmarks in your travels? Thank you so much! Getting married at the Stanley Hotel was exactly as amazing as my now-husband, John, and I had hoped it would be, and I’m thankful that our families had as enjoyable an experience as we did. We stayed at the Stanley (where The Shining plays on a constant loop on one of the hotel’s television channels) for ten days, and in addition to stalking the Estes Park elk herd (I admit, having become accustomed to regular old white-tailed deer in New England, I was quite taken with the elk, although John might go so far as to say I was obsessed), and venturing into Rocky Mountain National Park on more than one occasion, we participated in as many ‘haunted’ activities as we could fit into our schedule. We played Monster mini-golf and saw Ouija: Origin of Evil at the local cinema. We signed up for a historical tour of the hotel, as well as a ‘spirit’ tour, on which guests are introduced to the “active” phenomena and ghostly folklore surrounding the 100+ year old hotel, and educated on how to interact with the type of activity people have claimed to encounter in the past. On our second night of vacation, I bought a ticket to attend Illusions of the Past, a theatrical séance put on by the Stanley’s in-house illusionist, Aiden Sinclair, in the Billiards Room of the main building. The show made use of ‘haunted’ artifacts to summon the ghosts of past hotel guests, and the audience got to manipulate actual historic antiquities from events such as the hunt for Jack the Ripper and the sinking of the Titanic. Feeling bold, I volunteered to participate in a séance, for which I and four other women chose either a black bead or a haunted pearl from an opaque drawstring bag. The illusionist would have no idea who had chosen what, and we were to go around the room declaring “I have the pearl,” despite each participant being uncertain as to whether or not that was true. When the individual who did have the pearl declared as such, the planchette would flip off the Ouija board and into the air, coming to rest on the ground when the spirit had departed. When it was my turn to state, “I have the pearl,” I did so with lots of hesitation and little amounts of faith. I felt something stir within my hand, a disturbance among the molecules of whatever material my clenched fist concealed. With a screech of metal against wood, the planchette flipped, the room grew cold, and in the mirrored walls behind the illusionist, I watched as something scampered away for the abandoned quarters of the hotel before its presence could be more widely-discerned. John did not attend Illusions of the Past, however he was in for a supernatural phenomenon of his own. On the night of our wedding, while I stood on the dancefloor with my sister and three sisters-in-law, channeling Winifred Sanderson and belting out “I Put a Spell on You,” John felt a hand on his shoulder, as unambiguous and concrete as the feel of my fingers on the keyboard as I type. He spun around and looked up, expecting his mother or another family member to be standing over him, but there was no one there. An undigested bit of beef, perhaps, or a fragment of underdone potato? Your readers can be the judge as to whether there was more of gravy than of grave about my and John’s experiences, whatever they might have been. Beyond our shared love of horror, you and I have something else in common: we both have graduate degrees in psychology. As you’re crafting characters, do you find yourself returning to your education as a guide for how to realistically depict behavior? Are there any perhaps unlikely ways that your degree has impacted your writing? I have a Master’s in Counseling Psychology, and I’ve been a mental health clinician at a detox center, numerous methadone clinics, and I currently work per diem on an inpatient psychiatric unit. I absolutely try to rely on both my education and work experience as a guide for how to realistically depict behavior. I also fall back on my knowledge of psychology in general to inform broader challenges within my writing. I think having a solid foundation in psych helps keep writers from plunging into the pitfalls of stereotypes and overdone tropes. How many times have we seen villains whose sole basis for evil is sociopathy, schizophrenia, bipolar, and/or psychosis? How many times have we seen characters pigeonholed into the ‘bad guy’ role because they’re a ‘junkie’ or a ‘crackhead?’ A lot of my short fiction has dealt with addiction and mental health, and the first novel I ever wrote is sort of a Silence of the Lambs meets Trainspotting, where something sinister goes down at a Maine manor-turned-drug-treatment-center. From January 26th-28th, I attended the Borderlands Press Writers Boot Camp to workshop a horror/crime thriller I’ve been plugging away at over the past year, called Coming Down Fast. Last August, I met author and artist Dean Kuhta at NecronomiCon, and I’m putting the finishing touches on a short story called “Three Cheers for Sweet Revenge” for Issue #2 of Outpost 28, a Lovecraft-inspired dark fiction magazine Dean invited me to be a part of. I have additional work forthcoming from Quantum Corsets’ Her Dark Voice 2, Black Ice Magazine Volume 2, Space Squid, and Dead Oaks’ Horror Anthology Podcast. I have about ten other short stories in various stages of completeness, and my goal is to finish one a month over 2018, keeping in mind that new ideas will inevitably strike during that time, as well as to participate in a second short story collaboration with author David Emery, whom I met while judging a short story contest through The Write Practice and Short Fiction Break literary magazine. Tremendous thanks to Christa Carmen for being part of this week’s author interview series! Find her online at her author website as well as on Facebook, Twitter, Amazon, and Goodreads! This entry was posted in Fiction, Interviews on March 15, 2018 by gwendolynkiste.